Trout, Summer Steelhead a Specialty. Fall Chinook - Siuslaw Bay, Coos Umpqua Rivers. 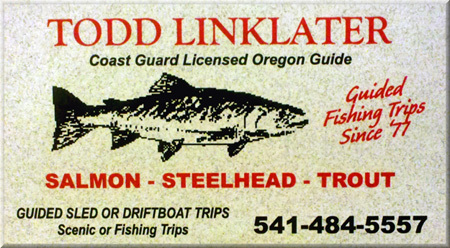 ©Copyright 2014 Todd Linklater Professional Fishing Guide. All Rights Reserved. No Photo Use Permitted. Site Designed & Maintained By Avalon Media Group Northwest.